The Enchanted Circle Trails Plan and the Taos County Community Conservation Plan are community-based plans that engaged locals in creating shared visions for open space conservation and brought together state-of-the-art GIS mapping and modeling with local perspectives and expertise. The Enchanted Circle Trails Plan is a blueprint for a comprehensive, cohesive, and connected trail system throughout the Enchanted Circle. This plan brought many voices together to develop a vision for how and where to expand trails to best meet key community goals—to expand access to safe in-town bike and pedestrian routes and to expand opportunities to experience the peace and adventure of backcountry trails, and to connect local communities to each other and to the unique and spectacular beauty of Enchanted Circle—improving quality of life and community health for many years to come. The Community Conservation Plan is not just a report or a set of maps. It's a way to tell the stories of local values based on local voices, perspectives, data, and knowledge. Meeting the goals identified in this Community Conservation Plan, and protecting, through voluntary land conservation, the priority areas it highlights, will take close collaboration among local governments, public agencies, and community partners—particularly the Taos Land Trust. These groups will need reliable funding and support for conservation, capacity-building, and stewardship to be successful. 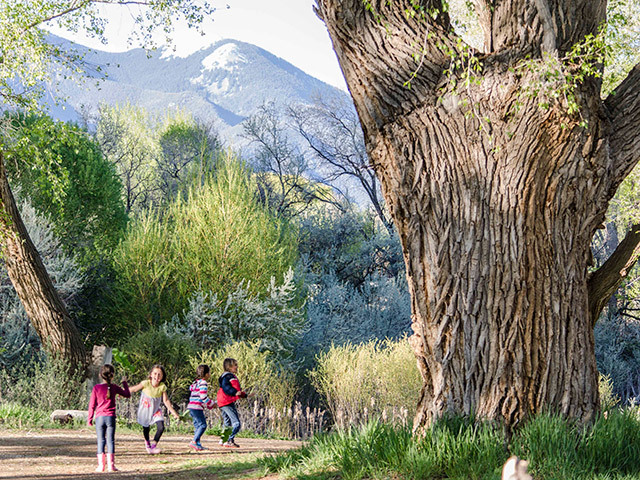 With help to protect its most special places—and the cultural traditions these places foster—residents of Taos County can thrive and Taos can continue to be a place "where cultural traditions are embraced and quality of life is excellent because everyone is connected to the land."